Review: Jealousness Pure Flawless Two-Way Foundation | Memorable Days : Beauty Blog - Korean Beauty, European, American Product Reviews. 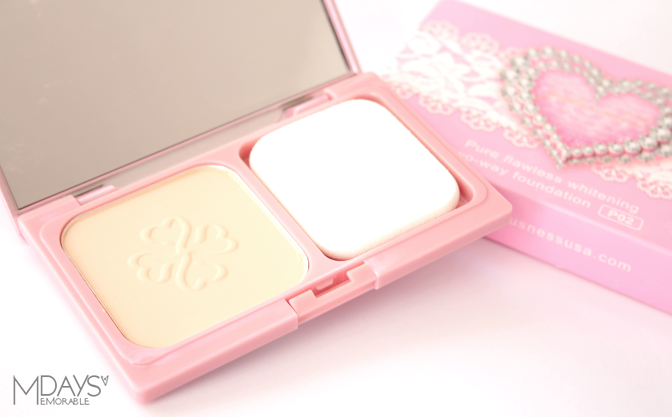 Check out this adorable powder foundation! It doesn't only look adorable it really does what it claims! You've probably seen my Jealousness USA blogpost from a view weeks ago (link to blogpost). I received these product from Eyecandys.com. Today I will be reviewing one of the products which is the Jealousness USA Flawless Two-Way Foundation (wow what a long name!). 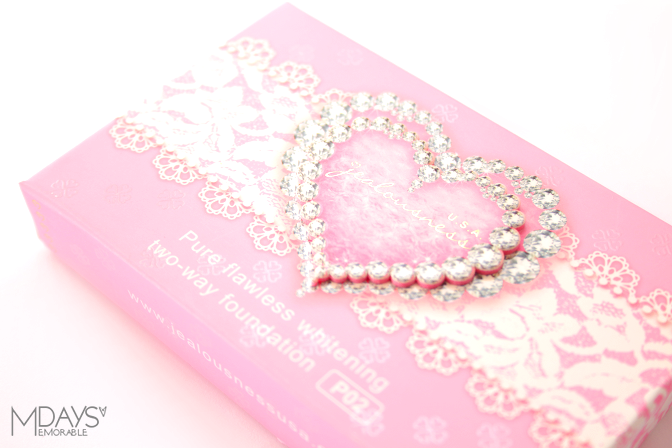 Jealousness Pure Flawless Whitening Two-Way Foundation is a compact powder that naturally covers unevenness with a feather-light, silky texture. Its unique formula makes it easy to create a naturally flawless, pore-perfecting finish. It also provides a long-lasting moisturizing effect. It's available in 3 colors: P01 Ivory, P02 Nature and P03 Wheaten. I thought that Ivory would be a bit too light on me so I decided to get the color P02. I'm a NC20 by the way. WHERE TO BUY JEALOUSNESS PRODUCTS? You can purchase this foundation at Eyecandys.com (link to the product) and it is sold for $23.90 there. There aren't many shops which offers Jealousness products so I'm glad that this website sells it. They offer worldwide FREE Shipping so make sure to check it out. Feel free to use my code: MEMORABLEDAYS to get a free gift at check out! I'm totally in love with this adorable cute pink packaging. Any girl would love this and you can easily carry this along in your make up bag since it's small (the size is comparable with an Iphone 5). The packaging has a 3d heart shape with the brand name in the middle. It also has a printed lace pattern on it. Since it's a Taiwanese brand, there are Chinese descriptions at the back. My Chinese isn't that advanced so I'm not able to translate the ingredient list. 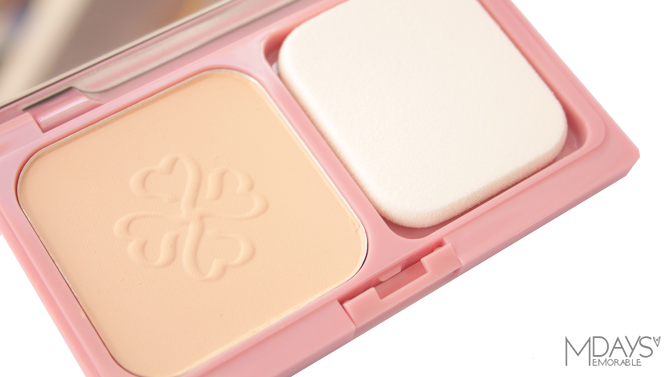 The foundation comes with a soft & comfortable puff and a mirror. With the puff, apply evenly to the entire face as the finishing step to your makeup routine. It's soooo nice to apply this powder foundation on the skin. It really has a feather-light, silky texture. I have never felt this before with any other product and I totally love the feeling. 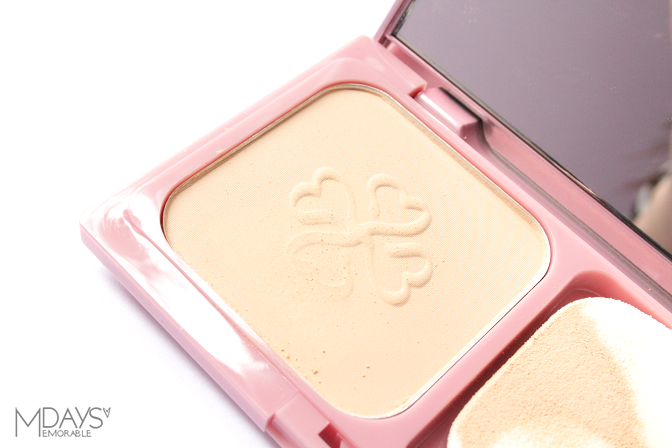 This scentless powder foundation has a light to medium coverage and it is buildable. It won't cover up your dark spots, freckles or acne scars but it will make it look lighter yet very natural looking. If you want more coverage, you can apply a sheer bb cream and apply this on top of it. It creates a matt but naturally flawless, pore-perfecting finish. Be careful that you are not putting too much, otherwise it will look cakey. As you can see it does what it claims. I do recommend to apply a good moisturizer and remove all the dry flakes off your face in advance if you have a combination dry or dry skin. This product won't make your skin feel dry, but it will accentuate dry patches if you don't moisturize it. I'm sure this problem won't occur if you have a different skin type. Therefore this product would work great for people with a normal or oily skin type. Would you like to purchase this powder foundation? Visit Eyecandys.com and don't forget to use my code: MEMORABLEDAYS to get a free gift at checkout.